Hi Caron! 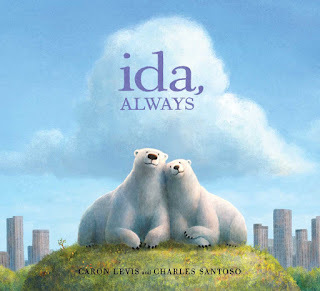 I love how your book, Ida Always, infuses hope while gently touching on loss of a loved one. Thanks for visiting ReFoReMo! This is already a challenge. I am tortoise paced at heart. Teddy bears or Polar bears? The short answer: I have loved them and believe now it’s time we leave them. While I have loved the opportunities, zoos have given me to observe animals, even as a child the experience was accompanied by a sadness, concern, and shame for participating in the captivity of another being. Providing people the opportunity to meet wildlife is important and there are amazing zookeepers who absolutely enhance the lives of animals in their care. However, I think that our humanity, technology, and knowledge of animals has advanced enough that zoos can give way to something that fosters a different relationship between all species of life. Perhaps zoos can be replaced with more sanctuaries that protect, heal, release, reintroduce wildlife with appropriate public access to allow humans to learn and bear witness to the wonder of animals and our impact on their world. Perhaps we could have more transparency and regular access to farms and slaughter houses so that we can make informed and mindful choices in how we use animals to enhance our own lives. 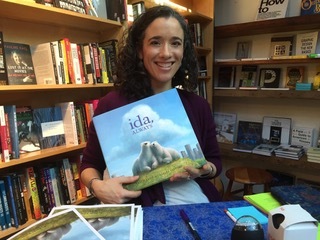 I struggled with the role of zoos as I wrote Ida, Always and my hope is that the book honors the lives they were able to create within their circumstances, what they gave us, the keepers who cared for, and all who were touched and inspired by them. NYC born, raised, still here and the inspiration for my next book Stop That Yawn! with LeUyen Pham. Taxi's honking or children's laughs? A few good ones or The more the merrier? Shortest answer: Friendships are wonderfully complex, always. Add-on: I have often marveled at how the universe has gifted me the right friend at the right time. Sometimes this person is an oldie-goody while other times it’s someone who I’d never have met if I wasn’t more-merrying. I just read Friends by Shannon Hale and LeUyen Pham and while it’s written for kiddos, it was the most wonderful right book at the right time for me now, too. Splashing in water or chasing and racing? Ida Always or Ida Always? You and so many other readers have been so kind to embrace Gus and Ida. Charles Santoso and I are grateful, always. Wow! Ida, Always, by Caron Levis, is lyrical and lovely. It touches on death in a peaceful and hopeful way. This would be a great book for evoking discussion of death and friendship. The illustrations add depth and power to the well chosen words. The bond between Ida and Gus is unmistakable and there's an emotional resonance to this story that stays with you long after you've read it. I highly recommend this book! 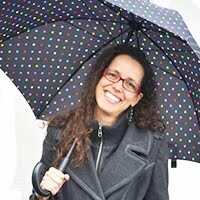 Caron Levis is the author of the picture books, May I Have A Word?, Stuck with the Blooz, and Ida, Alwayswhich the New York Times Book Review calls, "an example of children's books at their best." Forthcoming titles include Stop That Yawn! (Atheneum, 2018) and (Abrams 2019) Caron is an adjunct professor and the coordinator for The New School's Writing for Children/YA MFA program, where she earned her degree. She has an LMSW from Hunter College; after many years as an arts educator, Caron now loves using acting and writing to teach social, emotional, and literacy skills to students of all ages through her author workshops. Having trained in acting and dabbled in playwriting, Caron enjoys turning theatre techniques into writing tools through her workshop Act-Like-A-Writer. Visit her at www.caronlevis.com. Great interview! But now I'm wondering about bibliotherapeutic books and what is essential and import? I can guess what bibliotherapeutic means...but I've never heard those terms together. Sounds like it could be a hot topic! Regardless - congratulations on Ida Always! Beautifully done! Hi Angie, That's supposed to be IMPORTANT! Lol. Also I love bibliotherapeutic books because it's a great way to process anything hard in our lives...read a book about it and somehow you feel better and can probably discuss it better too! Aha! That makes sense. :) Gotta love autocorrect, right? Thanks! I totally agree! "Perhaps zoos can be replaced with more sanctuaries that protect, heal, release, reintroduce wildlife with appropriate public access to allow humans to learn and bear witness to the wonder of animals and our impact on their world." Caron, I love this <3 Thank you for your beautiful book and sharing your thoughts. Looking forward to your latest book. Thank you so much for reading and saying Charlotte. It was nice to have Kirsti pose this question and have a space to try and put words on these thoughts. Glad if they made any kind of sense.